Do you want to help collect money for the Voi Project? Great! If so, please contact the steering committee beforehand (contact details below). It is important that the committee know what type of activities and collections are taking place. Once you’ve informed the committee, feel free to use the Voi logo. Money can be deposited into the EFS Brunsnäskyrkan plusgiro account 11 76 88-2 if the money is for general costs for the orphaned children or in bank giro account 673-7993 if the money is for expansion of the farm. 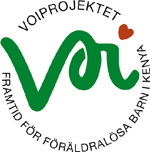 Use of the Voi logo or announcements that donations are going to Voi are not granted unless it has first been reported to Brunsnäskyrka, or deposited directly into the church’s account in Kenya. It is important that all the funds collected are able to be reported on the homepage, www.voi-ulricehamn.se, so that everyone who donates to the project can see that the money is making its way to the proper place. Questions? Comments? Please contact the chairman of the steering committee, Jan-Åke Thorell, at tel. 0705-937128.